Search for “Marketing Technology” and Douglas Karr’s blog will likely be the first Google result. Writing about online marketing services and strategies since 1999, he used his expertise to write Corporate Blogging for Dummies – a 400-page instructional book – 11 years later. It covers everything from choosing a platform to the legalities of publishing original content. Now, he lends his expertise to clients as the head of DK New Media in the Indianapolis, Indiana area. 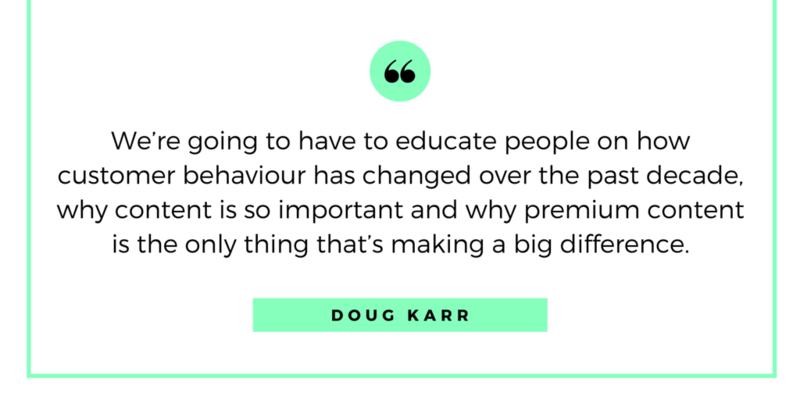 Tackling how to nurture a corporate web presence through blogging and social media, Douglas Karr is the third entry in our marketing influencer interview series. Keyhole: You wrote Corporate Blogging for Dummies for everyone involved in the blogging process – developers, content creators and managers guiding the overall strategy. Why did you decide to take that broad focus? 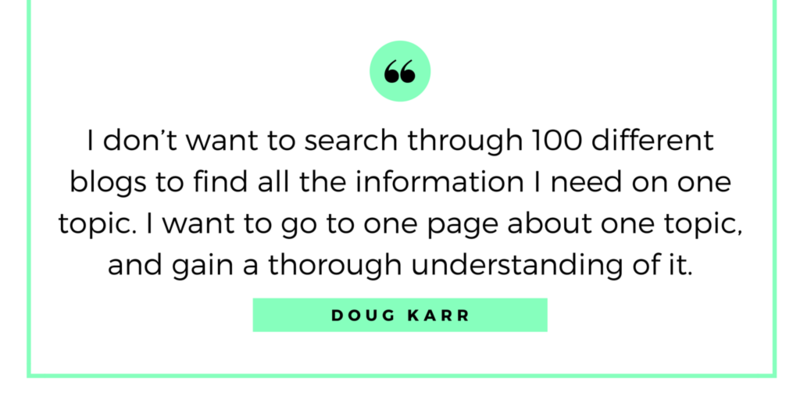 Douglas Karr: At the time, a lot of people had already written great books on blogging from a personal approach. What we saw happening, which was exploding, was companies doing it. But a lot of the information out there didn’t really apply to companies. It was focused on only helping individuals who wanted to start personal blogs. We wanted to move across the corporate enterprise where different people in different positions had different responsibilities in the process, and write specifically for each of them. KH: That definitely speaks to the fact that there’s more behind a successful blog than a writer. DK: Absolutely. But over time I think it continues to get easier, as the tools and integrations get more robust. At the time of the book, which was five years ago now, blogs required a lot of tweaking to optimize performance and rank on search engines. So, we needed to be as verbose as possible to give people step-by-step instructions for wherever they were in the blogging process. KH: Instead of discussing the state of blogging five years ago, where do you see the future of content and content marketing in five years’ time? Right now, I’m a bit of a contrarian to some of the processes out there. There are still a lot of agencies and people who look at content as just some sort of production vehicle. Like an assembly line, they feel they should keep spitting out basic content for the sake of continuously posting. That’s contrary to what readers and search engines want. I don’t want to search through 100 different blogs to find all the information I need on one topic. I want to go to one page about one topic, and gain a thorough understanding of it. I read an analysis about number one search results, and the average word count on those pages was like 1,890 words. When you look at what many companies are producing from a content standpoint, it’s usually 200- to 400-word blog posts day after day. But people are really demanding much more intensive material. So we’ve been pushing our clients to slow down on frequency, but increase their quality. We’ve been doing a lot more infographics, ebooks and enhanced blog posts with images and videos. Here’s what I pose to people: In the next five years or so, what’s the library of content that will put your site on top of the list in terms of trust, authority and findability? KH: What do you think will be the biggest challenge for content marketers as they move toward that model in five years? DK: Companies are already struggling when it comes to finding the ROI of content. I think the reason why they’re struggling with that is because they’re producing a lot of crap. If you’re telling someone they need to double down on their content, when so far they haven’t seen any results, that’s a tall order. We’re going to have to educate people on how customer behaviour has changed over the past decade, why content is so important and why premium content is the only thing that’s making a big difference. KH: Your Marketing Tech Blog has certainly built a strong presence. Take us through the journey of how the blog started and evolved. DK: This is a fun story for me to tell. It started as a personal blog 17 years ago, way back in the day. I was writing from a personal perspective of what I was seeing in the tech scene. Then, I joined a regional marketing book group and began using topics we covered as content. Around the same time, the blog became so successful that people were contacting me about what tools they should use for different issues. I kept my finger on the pulse, and all the requests I was getting became unmanageable. I needed to have a more dedicated publication. I launched marketingtechblog.com, as you may know it today, around 10 years ago. Every year, there’s been double-digit growth and it’s still our baby. We really enjoy writing and putting it out there. KH: You have a unique background, going from being an electrician in the Navy, to database marketing, to founding and heading DK New Media. How has your diverse professional experience shaped your views about marketing? DK: I think my background as everything to do it. Being an electrician, my job was mainly to troubleshoot equipment failure. That involved using schematics and metres to test voltage, amperage and everything else. It actually lent itself perfectly to marketing. As marketers, we’re trying to troubleshoot what’s not working. Then, we use tools and analytics to create a picture of what the issues are so we can test out ideas and constantly improve our efforts. KH: How do you and your team at DK New Media approach analytics? DK: It’s tough. For the most part, I think analytics raise more questions than they answer. Our clients have a lot of questions with reports. If they look at a visitor report without much context, they’ll almost always call us. Usually, they’ll see differences due to website changes, new content or because something took off on social media. That’s why we try to focus on trends. Season over season and year after year, we work to show our clients how they’re moving in the right direction. We really don’t get into nitty-gritty details about what’s happening on a website, for example. More or less, we look at weekly trends and compare them to previous weeks, months and years. When we focus on the long term and focus on those trends, it helps us make the right decisions as opposed to rash decisions. I’ll give you an example. 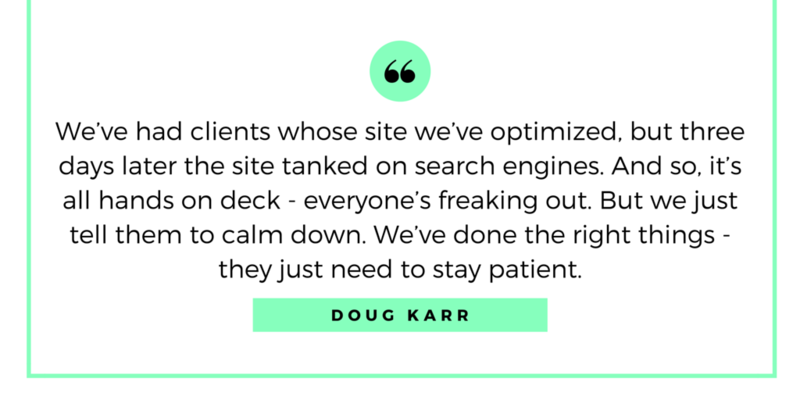 We’ve had clients whose site we’ve optimized, but three days later the site tanked on search engines. And so, it’s all hands on deck – everyone’s freaking out. But we just tell them to calm down. We’ve done the right things – they just need to stay patient. Three weeks later, we’ll see that they’ve risen above competitors and their previous rankings. It just took time for Google to reassess the site, determine what’s improved and place the new pages accordingly. KH: You just touched on my next question. For freelancers, consultants and marketers in agencies, what advice do you have when it comes to communicating metrics to clients? DK: We always take a multi-channel approach – explaining how one channel impacts the next one. My advice to marketers relates to the fact that I think people are always wired to focus on the things they’re good at. So, if you’re great at email, you’ll probably put out more emails. And if you’re great at content, you’ll put out more content. 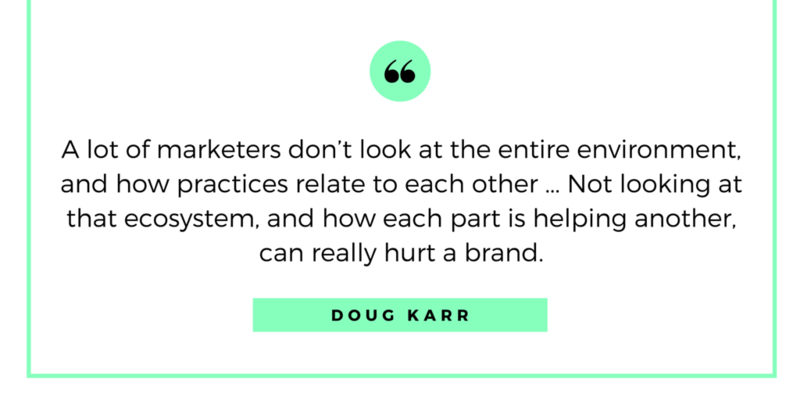 A lot of marketers don’t look at the entire environment, and how practices relate to each other. I’ll give another example. If you write a great piece of content – maybe an infographic – and it’s shared socially and picked up by other people who link back to you, your search ranking may go up. The keywords you’re driven higher on may not be related to conversions, but are research-type keywords that people just want general information about. They then go to your site, sign up for emails and convert three to six months later. Not looking at that ecosystem, and how each part is helping another, can really hurt a brand. We saw that a long time ago with content that pitted email against search against social, and looked at which practice you should put your money into. It makes me want to pull my hair out. It’s a disservice to the reader. But what the issue is – and what the writer didn’t realize – is that some people just don’t know how to attribute leads to social. They don’t realize that social helps expand the brand, build awareness and ultimately drive conversions. KH: Which SEO and social media tools are used by your team? DK: We use SEMrush for tracking keywords that our clients aren’t ranking well on and seeing how they’re growing over time. We like Wordtracker for keyword research. Wordtracker has this really cool aspect to it, where you can see the top questions people are asking about a keyword. KH: Shifting the conversation to social media, you’ve built an impressive social following for yourself and the Marketing Tech Blog, establishing yourself as a thought-leader online. What advice would you give to someone looking to become an influencer in their given field? DK: The biggest thing for us is continuing to give value to our audience. We’ve got a great following online, but it’s more of an audience than a community. Most people listen to us and read what we post, but there’s not a lot of conversation going back and forth. We’d like to change that. We’d like to develop a more robust community of leaders who are passing information back and forth, but it’ll take time to get there. For people starting out, focus on adding value to your network. The stuff you don’t see on social media with me is that I belong to a bunch of LinkedIn and Facebook groups. If I find something that’s really informative and compelling, I’ll share it before I even write a blog post about it. I just want to get the information out there. People then start looking to you as a source of information and guidance. It takes a while to earn that reputation. 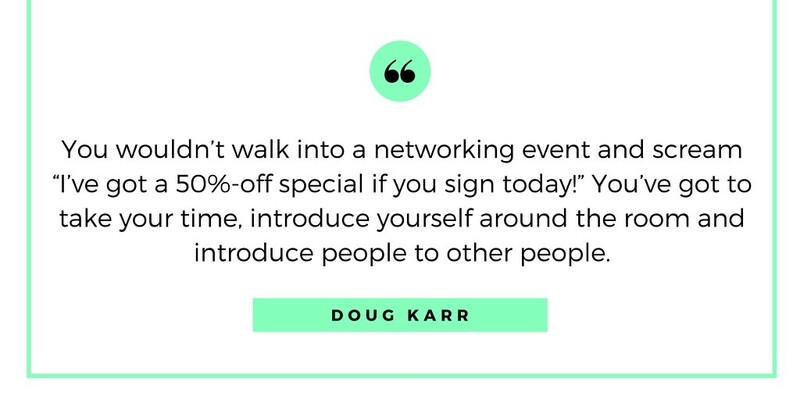 Like I tell people, you wouldn’t walk into a networking event and scream “I’ve got a 50%-off special if you sign today!” You’ve got to take your time, introduce yourself around the room and introduce people to other people. When you can, give input into the conversations and help people whenever you can. Over time, you’ll create bonds and that’s when the conversions will happen. With social media, I don’t think there’s ever been a better time for growing your network internationally. There’s just nothing that’s ever come close to this. I don’t need anyone’s permission – I can grow as much as I want. KH: Let’s finish off. Are there any opinions or bits of advice you’d like to leave us with? DK: When I started out, a lot of people told me the key to success in this business is to stay focused. Over time, you want to focus your attention and become an expert in a specific area. You can’t be everything to everybody. My area of expertise is marketing technology. My business partner’s expertise is content marketing. That’s where you’ve got to make up your mind. You’ve got to think “What am I going to do to make a difference?” When you start out small like that and become an expert in a very, very specific area, then you can expand outward. I write about content, social media, automation, integration and all sorts of topics. But I started on a micro-level and worked up to that macro-level.